Relax. The Gulf of Mexico is just right outside…and waiting for you! Stellar views from nearly every room will keep your stress level at an all-time low. Enjoy the convenience of an open floor plan to entertain and converse with guests plus the added comforts of new living furniture and fully updated kitchen and dining area. Each bedroom has been freshened up with new seaside-style bedding for that light and airy beachside feel. Each bedroom can privately access its own bathroom for added privacy even when your vacationing with your loved ones. If you need a break from lounging on the beach (it has been known to happen! ), just hop the resort shuttle and venture to the Village of Baytowne Wharf to try out some of their many water sports. Kayaks, boating, stand-up paddle are great ways to explore ‘the other side’ of Sandestin® Golf and Beach Resort when you paddle around and find unique creatures like crabs and fish in the bay waters. Within the Village of Baytowne, enjoy great restaurant options and shopping for any style. Seasonal guests can enjoy nightly entertainment like outdoor movies, live music and fireworks! Complete your vacation with additional amenities unique to Beachside II like a spacious lobby, gated upper and covered parking area, gated beach access, three elevators, luggage carts, large heated pool, grilling area poolside, fitness equipment, community lounge, ice machine, trash chutes on every floor and complimentary Wi-Fi. During Peak Season guests are required to wear a provided pool bracelet to use the pool. 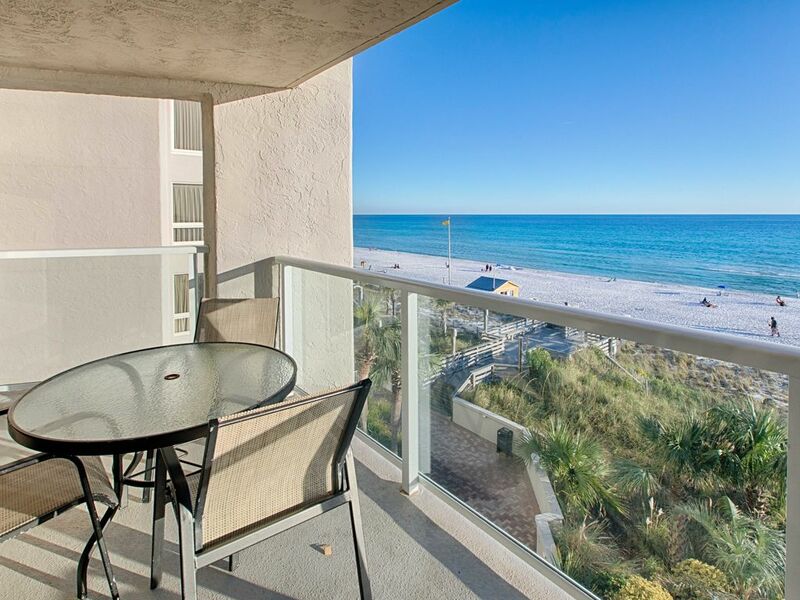 Relax, perched upon the large balconies of Sandestin, Florida beachfront condominium Beachside Two, located on the private beach-to-bay resort of Sandestin® Golf and Beach Resort. Beachside Two offers vacationers updated amenities and spacious accommodations which can be configured between studio, 1-, 2-, and 3-bedroom units. Large balconies, open floor plans and tall glass doors allow bountiful Gulf-views whether indoors or directly accessing the sugar-white beach. Many of the units are fully furnished and are highlighted by natural stone countertops, full-size kitchen appliances, dining room, living room, full-size washer and dryer. Most master bedrooms offer Gulf views and balcony access. Beachside Two is a great place to maximize family fun with dozens of amenities. On property is a large pool (heated seasonally), a fitness center and direct access to the beautiful white-sand Gulf of Mexico beaches. Dive into the additional amenities located on the Sandestin® Golf and Beach Resort like miles of dedicated bike paths, private beach, bay access, four renowned golf courses, a bustling tennis facility and minutes from popular Village of Baytowne Wharf™ where dining, shopping, night life and family fun await! Plan your Gulf-front family beach vacation here Beachside Two! Keyless Entry system - our guests love this! Our family vacation 2018 in Destin. The room was nice, clean and had all the amenities of home. The view from the patio was amazing. Parking was covered and adjacent to the building. Access to and from was very easy. One item that we could of used on the beach was the umbrella stake which was not included with the chairs and umbrella. If I would have known I would have brought ours from home and wouldn't have had to rent one. Overall this was great vacation stay and we will return. Thank you. The condo easily accommodated our family of four plus 2 of our children's friends. The condo is well stocked. Would have given 5 stars but the furnishings are showing some wear and tear. However, this condo is more updated in terms of finishes than many of the others that I looked at. Overall - a great stay and we would do it again. Great property! Beautiful beach! Can't wait to go back! This condo was well equipped and very comfortable. Unbeatable location. Perfect for families with children as you have a full kitchen with direct beach access. Prettiest beach you will find in north Florida panhandle. Best view from balcony, and we ate overlooking the beach both breakfast and lunch as well as a couple of home-cooked dinners. You save money and time for the beach by taking advantage of this unit and its well-appointed kitchen. Unit was clean and quiet. Would go back with our girls again! Beautiful views just not very clean at all!!! This property has amazing views! It was just lovely. But, it needs lots of TLC. The condo couch's had stains on it and love seat as we'll. Moreover, there was Mildew on the shower curtain in the master bath and cracks, holes, and chips all over the condo. The furniture needs replacing due to the many chips. The condo has a foul odor as well. And the condo did not seem clean at all upon arrival. The tile floor was awful. Most of the lamps don't work in many of the rooms. In addition the volume on the 2nd bedroom was not very good at all. My kids could barely hear the tv. When watching a movie one night. We did enjoy the location and loved sandestin but we won't be revisiting this property at all. We need to rent a property that is clean!!!! FYI...my vacation haven was professional but when I called to mention these remarks they said we will just take note of theses observations and offered to have a cleaning person spray the condo. Thank you for your feedback in regards to your recent experience at 4242 Beachside Two. I apologize for the issues you encountered. That is definitely not a standard for our units, and I am sorry that you weren't able to enjoy your stay as thoroughly as you should have been able to. We will definitely ensure our maintenance and housekeeping teams take care of the issues so they aren’t a problem in the future. Thank you for bringing this to our attention. We are glad you enjoyed the rest of your stay. We look forward to having you at one of our other properties.